The steam tube dryer generally operates at a lower temperature than other dryers and rotates at a slower speed. Material tumbles gently around the tubes that rotate with the shell, unlike the friction forces required by other types of dryers to process material. Consequently, it enjoys a longer lifespan than most dryers and requires very little maintenance. Louisville Steam Tube Dryers have proven superior to other types of indirect-heat dryer installations in which hot gas, rather than steam, is used at the heat source. Maintenance savings alone have often prompted replacement of other dryer systems with the Steam Tube Dryer. 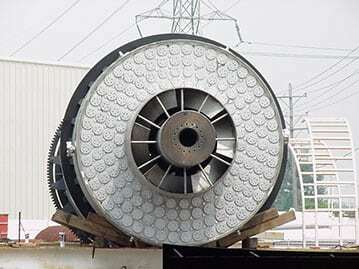 The Louisville Steam Tube Dryer is a rotating shell and tube heat exchanger which, very efficiently, utilizes the latent heat of steam to transfer energy to the material being processed, to drive off the water. Louisville Steam Tube Dryers utilize low-temperature drying, generating a very uniform heating of the particles being processed. Typical steam pressures range from 15 psig to 150 psig, but high-pressure units, up to 450 psig, are used in certain processes such as soda ash production. The principal operating procedure for a steam tube dryer is similar to a rotating tube and shell heat exchanger. Steel tubes or pipes are installed inside a rotating drum. 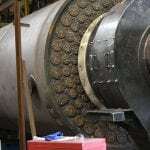 A rotary steam joint is utilized to deliver 100-150 PSIG steam which fills the inside of the tubes. Process material (to be dried) is continuously fed into one end of the drum and discharged on the opposite end. As the process material comes in contact with the outside of the tubes, the steam inside condenses into water. Due to the phase change, from vapor to liquid, the steam gives off (depending on the steam pressure) about 850 BTU per pound of condensate created. The thermal heat provided by the steam conducts through the tube wall and cooks the water vapor from process material. This type of drying is classified as indirect heat drying by means of a combination of conductive and radiant heat transfer. Using clean steam rather than products of combustion, Louisville steam tube dryers are one of the most ecologically-friendly drying technologies. 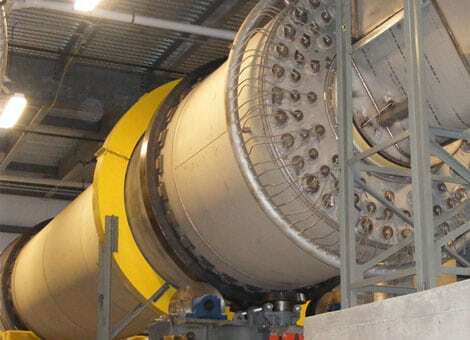 Louisville Steam Tube Dryers are indirect heat dryers utilizing the latent heat from clean low-temperature saturated steam rather than hot gases from fossil fuel-fired combustion systems. This highly efficient heat transfer design also makes Louisville Steam Tube Dryers one of the most thermally efficient drying technologies. Thousands of dryers around the globe share the Louisville design. We understand the duty cycle, wear characteristics, and uptime service needed for the dependability that many industries require. Our engineers and application specialists use their extensive experience and the latest in mechanical vessel software, including finite element analysis plus the vast actual operating history, records of performance for thousands of different dryers and hundreds of different applications. There are some Louisville Dryer designed units currently in the field that are operating consistently for over 7o years. One large chemical processor has reported that their LDC units will outlast standard type dryers by up to three times the lifespan. This could give an additional 10 to 20 years of operating cycle and capital cost investment payback.